Traffic made their debut in 1967 after Steve Winwood left the Spencer Davis Group. After a couple of hits the group quickly moved away from the singles format towards an album-orientated direction. They famously spent time "getting it together in the country", hence Berkshire Poppies. As this collection shows, the BBC made some amazing recordings of groups in a "live" context and it's great for music lovers that they are being made available. The snippets of interview and the voices of Brian Matthew, John Peel and other DJs adds to the flavour of the music. BBC sessions were mostly recorded at the corporation's Maida Vale studios. They were played "live" without overdubs although there was no audience. Members of the band were often interviewed as well. The recordings would go out on the Light Programme, later Radio 1. The BBC also used to supply discs of the sessions for overseas broadcasts. 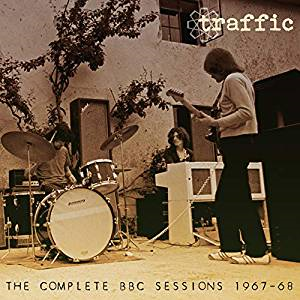 Traffic's three best-known tracks, arguably, are the singes included here. Paper Sun which kicks off the collection is a Steve Winwood song that signalled that the band were going to be very different to the Spencer Davis Group. While his distinctive voice stands out, the track is much more in tune with the psychedelic vibes of the time. A second hit single followed in the shape of Dave Masons Hole in My Shoe. This went further with extensive use of sitar as well as Chris Wood's flute giving the sing a very different feel. The third single was also a major hit. Here We Go Round the Mulberry Bush was the title track of a film that starred Barry Evans and was set in the new town of Stevenage. After these singles, the band focused more on albums. "Serious" music was moving away from singles and the rock album was coming into vogue. Consequently, many album tracks from around this time are as well known as singles and Traffic's contribution certainly stood up extremely well against their contemporaries. Check out Dear Mr Fantasy, Feelin' Alright, Smiling Phases, Coloured Rain and others included in this collection. After the release of he first album, Mr Fantasy, Dave Mason quit the band although he did rejoin for some sessions for the second LP Traffic. Steve Winwood left the band in early 1969 to form Blind Faith. This was arguably the end of the "glory years" of Traffic but they did reform to release a number of acclaimed albums. Nevertheless, the tracks on this CD could be seen as Traffic and their innovative best.